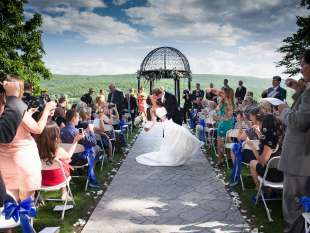 Whether your dream wedding includes a mountain vista or a lakeside view to exchange vows, the Pocono Mountains offers 2,400 square miles of natural beauty. From country inns to full-service resorts, we have solutions for all of your event needs including venue, food and beverage, wedding services, entertainment, guest accommodations and welcome kits. Save money and time. Contact Ann Pilcher, with your name, wedding size and potential dates and we are off and running. Need a little inspiration? Our innovative Wedding Builder can help you plan the Pocono Mountains wedding of your dreams! Our Weddings Pinterest Board is another great resource for Pocono Mountains wedding information.